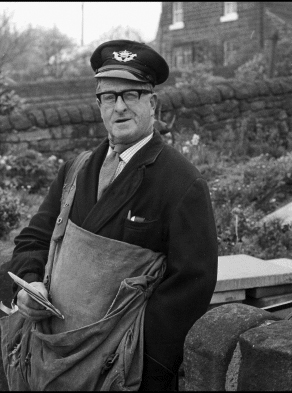 Ted was the one-armed postman for the village for many years (certainly in the 1950s and 1960s if not longer) – a great character. At one time he had to cycle between Crich and Wheatcroft, not an easy task with a loaded post bag and only one arm. Apparently he overcame the braking problem with string attached to the brake lever. 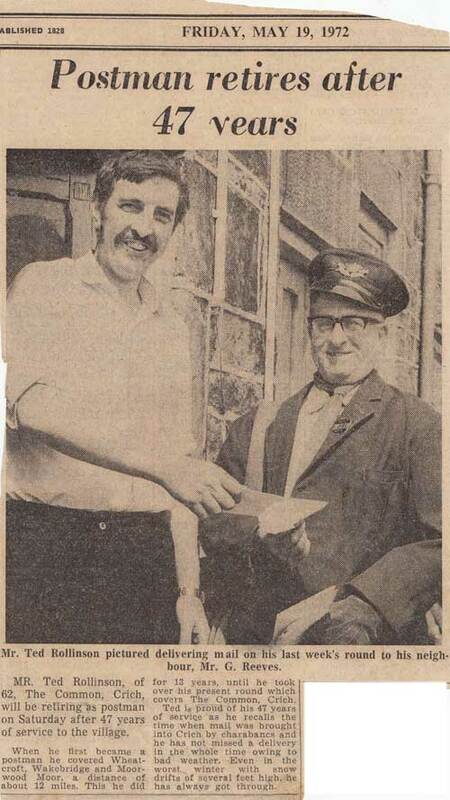 The post would be bought to Ted’s house on The Common by van from Matlock Sorting Office. The delivery postmen, who were “on earlies” would have a short nap, cup of strong tea followed by a game of darts before leaving Ted to his deliveries. Christmas Eve was always memorable. Many people on his round would give Ted a tot which he gratefully accepted. However, if you were at the end of the round, delivery time would be quite late and you would invariably have to fumble around in his bag to find your Christmas cards with Ted smiling, happily looking on. He managed very well with only one arm although applying sticking plaster to the occasional cut caused him problems. He would stem the blood by plunging the cut area into a pot of soot he had handy. Ted was a better source of news than any local magazine. Newcomers’ occupations, marital status and interests would be shared with their neighbours. He was as even handed as he could be though; the newcomers would be equally be regaled with appropriate details of their more long-standing neighbours.